There are some moments in a race to savour. One of the best has to be looking behind you on the trail in the final minutes of a race and not seeing another rider. With about 4 minutes to go at the MTB World cup Sunday I got to look back at the forest trail I had just covered, seeing hundreds of bike tracks through the mud, but no other riders. With 200m to go I could hear my name being called and knew I was about to win my first World Cup. The eyes started to well and a smile formed which wouldn’t leave for several hours. The venue of my first elite Canada Cup race in 2004 was now the host of my first World Cup win! I woke that morning at about 4am to the sound of pouring rain… and I fell back to sleep smiling. The rain would continue until the final moments of our race. A quick peak at the course prompted me to throw on Maxxis Medussa mud tires. It was a good call with the mud bogs and slick descents. The course, which had been altered recently on account of the large amounts of rain, took us immediately into a climb up a buff DH track before sending us back down mucky ski slopes and into woods which descended and traversed a lot of rocky and rooty terrain before spitting us back out at the start finish. Marie had her usual strong start, but we were together by the top of the first climb. I made a couple failed attempts to pass before heading into the first single track descent. After that I knew I felt comfortable pushing for more speed on the descent and made sure I got ahead before the next woods. Marie held my wheel into lap 2, but the gap increased on the climb and then more on the descent. Each lap I was able to pull further ahead as I got more comfortable in the mud. 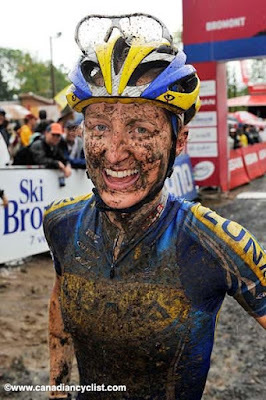 I couldn’t believe that having fun in the mud was my job! I crossed the line to big hugs from my mom, Dad, brother and husband. It was a great weekend for my team too with Katerina Nash putting in a great ride for 3rd and Georgia Gould claiming her 3rd World Cup 5th place of the Season. The weekend before at the Mont Sainte Anne World cup I got to stand beside Marie Helene on the podium as the Canadian anthem played for her victory. With Beijing quickly approaching it was pretty emotional for me. In Bromont positions were reversed, but I once again got to share the 1-2 positions with my Beijing team mate. 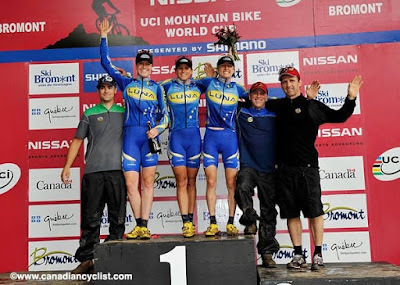 During the week I cracked my podium champagne with family and friends in Bromont over a sushi dinner. Liz, a physiologist with Pacific Sport and my brother’s girlfriend had just returned from Olympic Staging in Japan with Canada’s men’s rowing team. My brother Geoff got into character for Sushi making with his new Japanese garb. There’s nothing like being on the road and getting to share a great home cooked meal & laughs with friends! So now it’s prepping for Beijing. I’m back in Kamloops where afternoons are 32 to 37 degrees and I’m able to get in some good heat acclimation while enjoying the benefits of being at home. I head to Beijing with my husband on the 17th and yeah I’m more than a little excited;-) This year has been amazing. Everyone has been so supportive and I definitely consider every email and confidence in me a huge part of the success I’ve found this season. Thanks and look forward to sharing my time at the Olympics with you. I’ll try to keep my blog updated!